Here’s a random list of five things that I’m always surprised has hung onto a level popularity, haven’t faded away and have become a part of a buried time capsule yet. Karaoke – At the top of the list of most common phobias is always public speaking. So naturally I would have assumed there wouldn’t be too many willing candidates to stand up in front of a bar full of people. I was wrong. For some reason if you hand them a microphone and ask them to sing ‘Love Shack’, they’re more than willing to do it. I suppose it helps that no one expects them to sound like Sinatra and the worse they sound, the more successful they’ll be with the crowd. Wheel of Fortune – This show was at its peak in the mid-80’s. Everyone tuned in, Vanna was the “It Girl” and Pat Sajak was cool. He even had his own talk show which ended pretty quickly. It looked like “Wheel” was on its last legs, but it just keeps spinning along. The show just seems so….square. I’m not sure who is still watching it. My guess is senior citizen homes are the only televisions that consistently tune in to it. Maybe a few doctors offices too. Doesn’t anyone else find it annoying that these contestants have to clap every single time when they spin that friggin wheel!!! Animal Crackers – I don’t like these things. 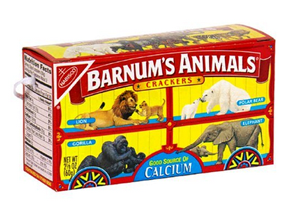 The best thing about them are the animal shapes and the little boxes that look like a circus train that they come in. It pretty much ends there. They’re not really crackers. I wouldn’t mistake them for a Ritz and I’ve never put cheese on an elephant and munched away. They’re more like cookies, but they don’t taste good like a cookie is supposed to. They barely have any taste at all! If I’m going to have a snack I want it to have a yummy taste. Give me some sugar, cream, peanut butter, cinnamon, chocolate chips, something! Kids must still be falling for the fun animal look to these things. I was taken in and have since seen what they truly are! When I see someone eating a box of animal crackers I inevitably say “Hey, save the whales!”. You can use that joke if you want. Thongs – I didn’t say all of these would be things I don’t like! Thank you thongs for being popular!!! Infomercials – A lot of people must be buying the crap they advertise if they’re still airing these things. Do people really believe the guarantees of growing a thick head of hair, giving you a body builder physique or making you a millionaire by the end of the month???? Maybe that’s why they air these things at 3am when you’re half asleep, you’re more susceptible to think that these products are actually worth having and have some kind of value. How can people be so suspicious of politicians and the government, no one trusts one word they say and at the same time they’ll believe Miss Cleo is a completely sincere and rational person?